Best of luck to our senior footballers who will play against Raheen in round 4 of The Tullamore Court Hotel Offaly Senior B Football Championship in Bord na Mona O’Connor Park on Saturday evening at 6pm. All support for the team is very much appreciated. The numbers drawn this week were 13, 15, 27, 31. No jackpot or match three winners. Next week’s draw will be held in Gussies on Monday night at 10pm for a jackpot of €6,600. On Saturday morning last Rhode U10 footballers headed off to Trim GAA grounds to play in the Leinster Community games football semi final against East Meath which kicked off at 9:30am in warm and sunny conditions. Rhode played excellent from the off and went ahead at an early stage but late on East Meath came back at them but it wasnt enough as Rhode kept them at bay. Full-time score Rhode 8-05 East Meath 6-03. Rhode then marched on to the Leinster Final against Clontarf at 1:30pm. Following the semi final the Rhode players and the massive contingent of supporters got a 2 hour break before the Leinster Final. The final was a wonderful game to watch throughout and went down to the wire but unfortunately it was not to be for the young future stars as Clontarf were crowned Leinster champions. Interestingly, Rhode had more scores but the old cliche, goals win games, proved relevant. Final score read Rhode 3-11 Clontarf 8-02. The management, players and supporters can be very proud of their wonderful performances through out the day. Following the game Rhode received their silver medals to great cheers of the proud Rhode support. They may feel disappointed but can be very proud of their achievement. A massive thank you to all the supporters who travelled up to watch the young lads; it was great to see. The players and management would like to thank Colm Killeen for sponsoring their tops, Kieron Dunphy for supplying refreshments for the day and Niall O'Toole for the drinks and crisps on their return to Rhode. It was very much appreciated. Well Done to the Team Management of Declan Curley, Mck Fleming, Emmett Mayon and John Murphy. U10 Panel: Peter McGrath, A.j Hickey, Jamie Dalton, Jason Curley, Dylan McGloughin, Cian McNamee, Ruairi Carroll, Drew Fleming, Oscar Egan, Daithi McCabe, Gavin Mayon, Jake Murphy. Rhode Senior Footballers take on Ferbane in the Senior Championship on Sunday July 22 at 3:30pm in Bord Na Mona O'Connor Park. Rhode Junior A footballers take on Clara on Sunday, July 22 in Clara at 12 midday. Rhode Junior B Footballers take on Shamrock's in Fr. Dowling Park Rhode on Friday, July 20 at 8pm. Very best of luck to Rhode U13 footballers who take on Na Fianna on Friday July 20 in the U13 league final in Ballycommon at 7:30pm. Rhode Senior footballers will take on Cappincur in the Division 1 League Final at 7:30pm on Saturday July 28 in Clonbulloge . Join Rhode GAA club in commemorating the centenary of Gaelic Sunday on Saturday, August 4. A hundred years ago in August 1918 Gaelic football teams played matches all over the country in defiance of the ruling British forces. To replicate the game played against Edenderry in 1918, Rhode Senior footballers will be playing Edenderry in the Offaly Senior Championship at 6:30pm. Following the match we will be having a BBQ in Killeens @ 9pm with music by Caz, entry €10. Also on the night there will be a presentation to Rhode/Croghan Lourdes fund . The GAA Cul Camps takes place this week in Rhode and Over 200 boys and girls will be taking part. Great week for Shannonbridge GAA Club in the Offaly Intermediate football championship. Two wins in 5 days puts us in a good position in the Intermediate championship group stage after four games. Saturday 7th result: Shannonbridge 2-15 Tullamore 1-12. 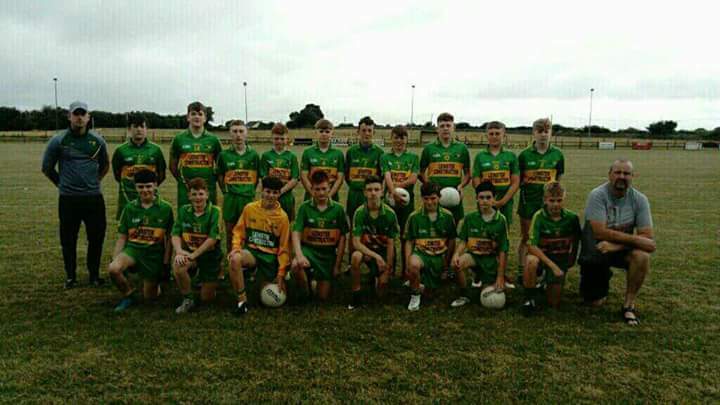 We scored an impressive win over a plucky Tullamore in extremely hot conditions in Kilcormac last Saturday evening to prevail by 6 points. Wednesday 11th July result: Shannonbridge 2-10 Clonbullogue 2-09. The bridge ground-out a hard fought one point win in Mucklagh after being 6 points down at one stage in the first half to put ourselves into a strong position in the championship groupings. Shannonbridge GAA would like to express sincere sympathies to the McEvoy family, Clonascra on the recent untimely death of Eimear. Shannonbridge/Doon GAA lotto results Monday, July 9: No jackpot winner. Numbers: 1-12-15-21 6 match threes. Next week's jackpot will be €3,800.